Human Right Centre - Università di Padova | Workshop "Civil Society participation in Intercultural dialogue"
In the framework of its thematic network activities on capacity building and curriculum development in the area of intercultural dialogue and multi-level governance the Jean Monnet Centre of Excellence organizes 9-10 May 2011 a 2 days-Workshop on "Civil Society Participation in intercultural dialogue". Focus is on the relevance of civil society practices in intercultural dialogue seen from a comparative European perspective. 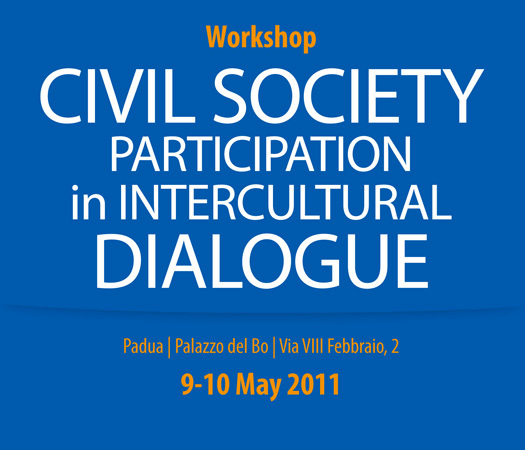 Special attention will be given to the role of civil society in cultural dialogue with the analysis of a few case studies and practices from international development cooperation. Session 3 illustrates concrete (innovative/alternative) practices of intercultural dialogue-building in international development cooperation. Among the speakers of the WS are Mrs. Gemma Aubarell (Head of Programme Coordination Unit, Anna Lindh Euro-Mediterranean Foundation, Alexandria, Egypt), Vesna Čopič (Lecturer, Faculty of Social Sciences, University of Ljubljana), Raj Isar (Professor of Cultural Policy Studies, the American University of Paris), John Farina, (Professor, Department Religious Studies, George Mason University, USA), Michael Thoss (Head of the Allianz Cultural Foundation, Munich), Manuel Manonelles (Director of Barcelona Office Culture of Peace Foundation) Robin Wilson (leading international policy analyst and commentator on intercultural dialogue, Belfast) and Antonella Valmorbida (Director, Association of the Local Democracy Agencies, Council of Europe). The Workshop takes place in the Aula Nievo and is open to the general public. Local democracy and citizen's participation: practices in comparative perspective. A human-centric international cooperation approach: the experience and project assessment of the "Agronomi e Forestali Senza Frontiere"